The behavior of current “high-powered” high-speed users may offer a glimpse into the future. In our December 2005 survey, the median broadband user did three online activities on a given day (out of a list of ten) compared to one for the median dial-up user.7 This is indicative of how a high-speed internet connection pulls people to broader engagement with the internet. Within the group of broadband users, however, some are more engaged with the internet than others. This section examines the news-gathering behavior of broadband users with the closest relationship with the internet, as measured by the number of online activities they do on an average day and the frequency with which they log on. These high-powered broadband users are defined as those who do four or more of the ten activities on a given day. They are more likely to log onto the internet several times a day than other broadband users (by a 78% to 37% margin). Additionally, they make up a substantial portion of home broadband users—about 40%—or approximately 29 million people. Why focus on this high-powered segment of broadband internet users? First, it might offer a glimpse of future behavior in the general population. To the extent that these users are trailblazers—and the fact that they have been online longer (than other broadband users and much longer than dial-up users) suggests they may be—later-comers may mirror their behavior. The growth of broadband penetration in recent years and future upgrades in network speeds are other reasons to think these users may hold clues to future behavior. Second, these users are elite in ways separate and apart from connection speed. They are better educated (49% have college degrees or more compared with 36% of other broadband users and the 27% national average) and high-income. Fully 46% of elite high-speed users live in households with income over $75,000 annually compared with 32% of other broadband users and 21% for all respondents. High-powered users may feed information to others. High-powered users are heavy consumers of online news. They make up 44% of the population of internet users who seek out news online on the average day. Nearly three-quarters (71%) of high-powered broadband users turn to the internet for news on the average day, a rate three times that for remaining high-speed users. The internet is the most frequently used news source, on the typical day, for elite high-speed users, outpacing local and national TV newscasts, which traditionally lead the way. 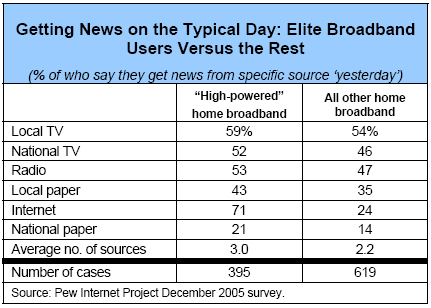 Since 72% of these users watch either local TV news or national news on a typical day, this means elite broadband users are equally as likely to get news from TV as the internet on the average day. For the heavily engaged broadband user, it is clear that online news occupies a central place in his or her daily newsgathering habits in a way that distinctly differs from other broadband users.